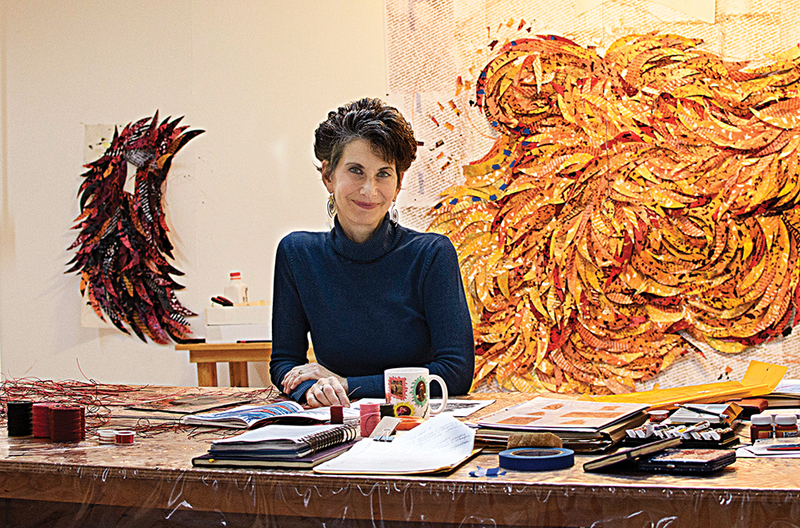 Textile artist Deborah Kruger turns to plastics. Published on Friday, January 18, 2019. This article appears in the December/January 2019 issue of American Craft Magazine. Cambodia, 2018, screenprinting on fused plastic bags, thread, 3.5 x 4.25 ft.
As the founder of an artist residency, Deborah Kruger has often found herself staring at applicants’ work and finding that the form didn’t match the concept. Since 2012, Kruger and her partner, Christian Robertson, have run 360 Xochi Quetzal (it means “sacred bird” in Nahuatl, an indigenous language), an artists’ and writers’ residency and retreat in Chapala, Mexico. In her fourth year of reviewing samples, she had an unnerving epiphany: “I realized that I’d never stopped to apply that same criterion to my own art,” Kruger says. 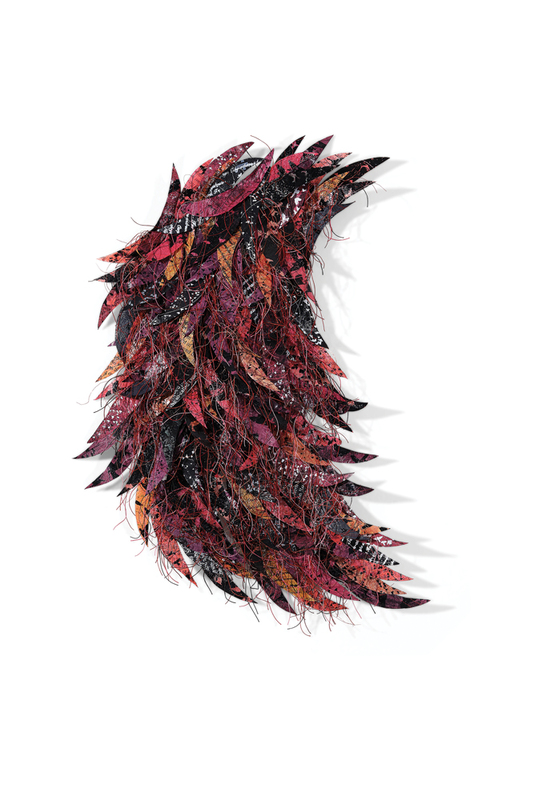 For more than a decade, Kruger, a native of Queens and a former wallpaper and textile designer, had been producing a series of works constructed from fabric feathers cut into long crescents, outlined with encaustic. She arranged them into annular patterns, integrated them into tapestries, and even formed them into baskets. The work brought her success, with numerous group shows south of the border, and in 2010 she moved to Chapala to work in an airy, light-filled studio. But running the residency made her realize she had more to say as an artist. And she wasn’t going to say it with fabric. Turbulence, 2018, screenprinting on fused plastic bags, thread, 5.25 x 8.5 ft. 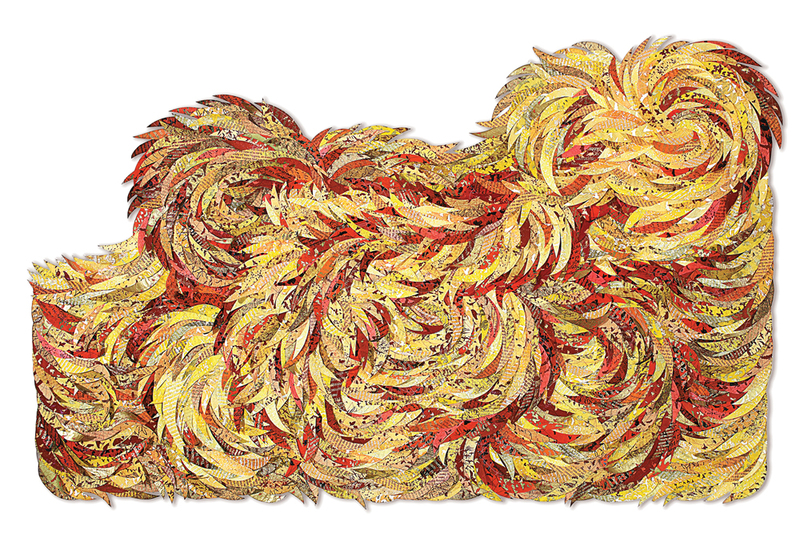 Flourish, 2017, screenprinting on fused plastic bags, thread, 3 x 2.25 ft. The feather form, whether layered or spun, as in Vortex (2018), resonates with Kruger, particularly as a symbol of migration and diaspora. 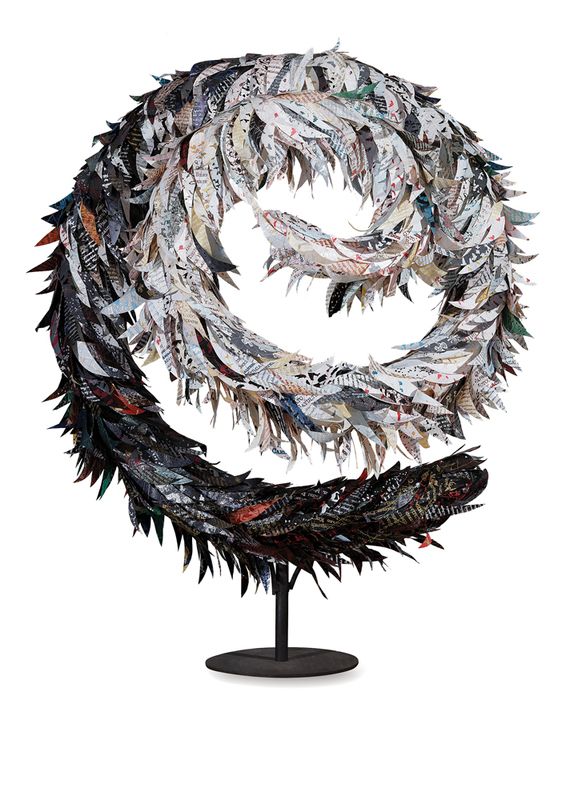 When Kruger returned to Mexico, she began experimenting with new options for the feathers and using an iron to fuse plastic bags – a symbol of trash and excess – to create a sort of crinkly plastic paper. In Mexico, the plastic bags retailers use are not necessarily plain white with “Muchas Gracias” stamped on them; they come in bright and distinctive colors. Kruger and her assistant, graphic designer Sandra Hernandez, began noting the new colors that resulted from layering the bags. They didn’t stop with simple color-wheel configurations – red and blue makes purple, etc. – but added subtler variations. They developed more than 80 possible hues using combinations of three colors. A black bag on the bottom made a purple into a rich eggplant; an extra pink layer on top yielded a pale lilac. Onto those “bag papers,” Kruger and Hernandez began silkscreening images of birds, based on the drawings she’d made in France. The women limit themselves to printing in a handful of ink shades – relying mostly on black, deep jewel tones, and metallics – and cut the results into Kruger’s signature feather pattern. It’s a labor-intensive process, but Kruger has hired nine women to work in the studio, running a silkscreen mini-assembly line. As the process evolved, Kruger and Hernandez wanted to add another layer, literally and figuratively. They began printing images of birds on one side of each fused sheet and text on the other. Some finished works feature lines from Rachel Carson’s Silent Spring, the book that launched the modern environmental movement and a longtime inspiration for Kruger. Other sheets feature text in Yiddish and shorthand, and lists of indigenous Mexican languages with few living speakers left. Curators are beginning to take notice. This fall, a piece goes on view at New York’s Hebrew Union College as part of an exhibition examining climate change through a Jewish moral lens; it will remain on view through June 2019. Closer to home, she recently installed her first solo show at the Chapala cultural center. Fittingly, the building sits just two blocks from Mexico’s largest freshwater lake, full of pelicans, herons, and egrets.